Spreadsheets provide one of the most easily learned routes to scientific computing. This book uses Excel®, the most powerful spreadsheet available, to explore and solve problems in general and chemical data analysis. It follows the usual sequence of college textbooks in analytical chemistry: statistics, chemical equilibria, pH calculations, titrations, and instrumental methods such as chromatography, spectrometry, and electroanalysis. The text contains many examples of data analysis, and uses spreadsheets for numerical simulations and testing analytical procedures. 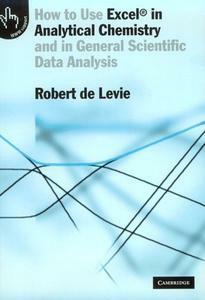 It treats modern data analysis methods such as linear and nonlinear least squares in great detail, as well as methods based on Fourier transformation. It shows how matrix methods can be powerful tools in data analysis, and how easily these are implemented on a spreadsheet. It describes in detail how to simulate chemical kinetics on a spreadsheet. It also introduces the reader to the use of VBA, the macro language of Microsoft Office, which lets the user import higher-level computer programs into the spreadsheet.